Phosphatase Inhibitor Cocktail III effectively inhibits serine/threonine and alkaline phosphatases. Phosphorylation of proteins and lipids is a hallmark of the signaling or metabolic status of cells. A cocktail of three phosphatase inhibitors for the inhibition of both serine/threonine and alkaline phosphatases. 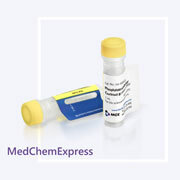 Each vial contains a 1 ml solution with the following components: 500 µM Cantharidin, 2.5 mM (-)-p-Bromotetramisole oxalate, and 1 µM Calyculin A form Discodermia calyx. 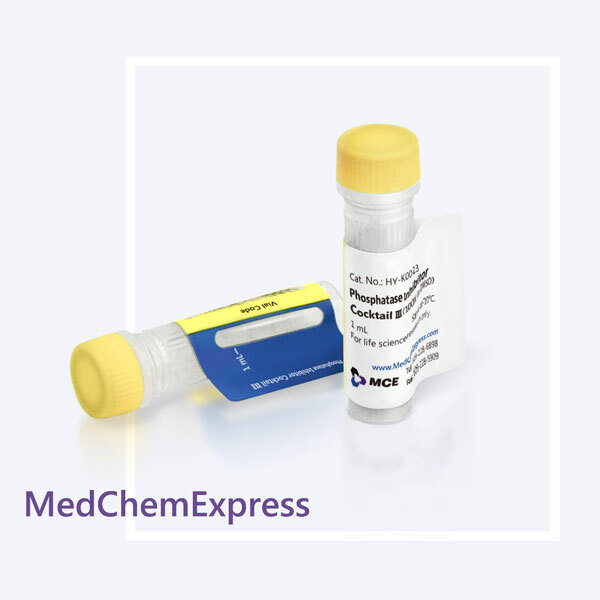 Phosphatase Inhibitor Cocktail III has been optimized and tested for mammalian cell and tissue extracts. This cocktail is supplied as a ready-to-use solution in DMSO. • Nat Cell Biol . 2018 Oct;20(10):1145-1158. • Cancer Lett . 2018 Aug 10;429:29-40. • J Neuroinflammation . 2019 Jan 16;16(1):10. • Front Pharmacol . 2018 May 16;9:518. • Exp Cell Res . 2019 Mar 4. pii: S0014-4827(19)30094-1. • Cancer Med . 2018 Aug;7(8):3965-3976. • Int Immunopharmacol . 2019 Jan 25;69:103-108. • Onco Targets Ther . 2018 Feb 26;11:1025-1035. • Fitoterapia . 2018 Jun;127:279-285. • Biomed Res Int . 2019. April. • PeerJ . 2018 Sep 4;6:e5524. • Int J Ophthalmol . 2018 Jun 18;11(6):905-909. The product should be stored at -20°C, and is stable for up to 12 months. When kept at 2-8°C, the product remains stable for 2 months. Thaw at room temperature. Before assaying, add each solution at 1:100 (v/v) dilution to samples (such as cell lysates or tissue extracts). Mix the sample sufficiently after each time of addition. Application Fields: Western Blot analysis, Co-IP, pull-down, IF, IHC, kinase assay and etc.